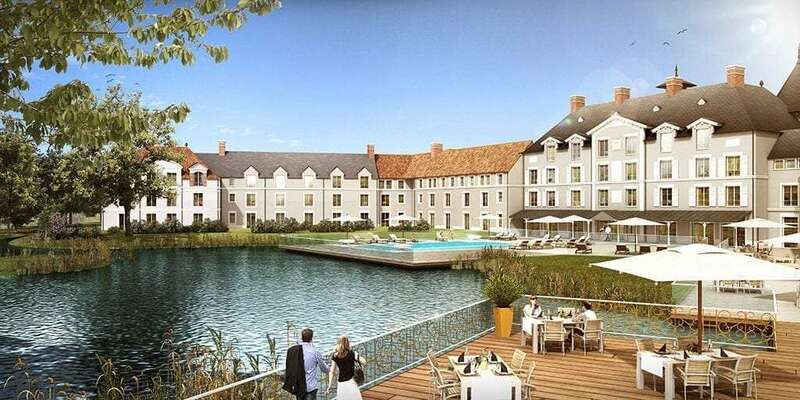 Dublin-based aparthotel operator Staycity Group is poised to open its first resort-style property comprising 284 apartments, 22 holiday villas, an outdoor swimming pool, café and restaurant as well as extensive gardens and terraces. Staycity Aparthotels Paris, Marne la Vallée is conveniently located just 35 minutes by car from central Paris and 10 minutes from Parc Disneyland® Paris. It’s also close to both the Val d’Europe RER Station and the terminus Marne-la-Vallée-Chessy with a TGV from Charles de Gaulle airport to Marne-la-Vallée-Chessy taking just 12 minutes. The new-build property, built on a four-hectare greenfield site, is scheduled to open this August, offering studio and one-bed apartments as well as 12 four-bed villas sleeping up to 16 people and 10 five-bed villas sleeping up to 20 people. Prices start from €99 for a studio and €385 for a villa. Guest facilities include a lounge, children’s play area, gardens, and gym as well as a free shuttlebus to and from Parc Disneyland® Paris. The property has parking for 182 cars and has three meeting rooms with a break out area for business and conference use. Marne-la-Vallée is Staycity’s second property in Paris. “We are thrilled to be opening in this fantastic location with what will be our first property with extensive leisure facilities alongside holiday villas,” commented Tom Walsh, Staycity’s CEO and co-founder. Average stay is anticipated to be around 3.5 nights with the majority of guests coming from Europe. Bookings will be taken via the company’s website, www.staycity.com, as well as via OTAs and tour operators. In addition, the fast-expanding Staycity, which has some 7,000 apartments [operational and pipeline] across Europe, will this year open new properties in Berlin, Venice, Edinburgh and Manchester. The company recently announced the acquisition of a former theatre site on Francis Street in Dublin, which will open in 2020 as a 242 apartment Staycity Aparthotel together with restaurants, shops and an exhibition centre. A second major deal will see the company open 248 apartments in London’s Paddington as part of a €231m, 620-room hotel and aparthotel complex. Staycity is also involved in the construction of the Paddington venture in a three-way joint venture partnership with The Pickstock Group, Staycity and BSW Land & Property. The development is scheduled for completion in 2021. Staycity operates under the Staycity Aparthotels brand and its premium Wilde Aparthotels by Staycity brand. The group’s growth target is to reach 15,000 apartments by the end of 2023. Award-winning Staycity Group is a privately held company based in Dublin established in 2004 by CEO Tom Walsh and his brother Ger. The company has since become Europe’s leading independent aparthotel operator, offering quality short-term and long-term aparthotel lettings in 10 central city locations across Europe. The properties operate under the Staycity Aparthotels brand and its premium Wilde Aparthotels by Staycity brand. Staycity’s aparthotels appeal to both business and leisure travellers who are looking for a more user-friendly, cost-effective alternative to hotels. Staycity’s properties are made up of studios, one-bedroom and two-bedroom apartments offering 24-hour reception, kitchens or kitchenettes, a dining area, sitting area and bathroom as well as complimentary Wi-Fi access, flat-screen TV, guest laundry facilities and weekly housekeeping. Most sites have car parking and many now offer a dry gym, guest lounge and café selling breakfast, all-day snacks and drinks. The company’s fast-expanding estate now includes properties open in Birmingham (249 apartments), Dublin (228), Edinburgh (146), Liverpool (268), London (541), Lyon (144), Manchester (182), Marseille (108), Paris (50) and York (197). In 2015 Staycity Group won the ‘Industry Breakthrough’ award at the Association of Serviced Apartment Providers (ASAP) Annual Awards and was inducted into the Tripadvisor Hall of Fame. In 2016 the company was highly commended in the ‘Business of the Year’ category at the ASAP Awards. In 2018 Staycity won ‘Best Operator’ in the Serviced Apartment News Awards while in 2019 CEO and co-founder Tom Walsh was awarded the accolade ‘Industry Inspiration’ at the same awards as well as being shortlisted for ‘Best Property’ for Wilde on the Strand, and ‘Best Operator’.